Over two years after the vicious murders of five members of the Fogel family of Itamar, four PA Arabs have been sentenced to between two and seven years in prison for the assistance they rendered to the two Arab terrorists who carried out the attack. The two terrorists, Hakim Awad and Amjad Awad, were both sentenced to five life sentences for their crime, which they confessed to last year. As a result of the investigation that led security forces to arrest them for the murders, three other relatives of the two Awad brothers were tried and convicted of assisting the murderers to carry out their crime. Salah Awad was convicted of admitting to his home the two murderers on the night the Fogel family members were killed. The two told Salah Awad of their act, and he allowed them to leave the murder weapons in his home and gave them a change of clothing so they could get away. Later, he moved the weapons to another location after getting wind that he was part of the investigation. He was sentenced to seven years in prison. Another culprit, Hassan Awad, also arranged for hiding places for the terrorists. He was sentenced to 23 months in prison, and will be required to pay a fine. A third culprit, Yazid Awad, admitted to investigators that he had knowledge of the murders and of the Awad brothers' role in the crime, and offered them “material assistance.” He was sentenced to four years in prison. 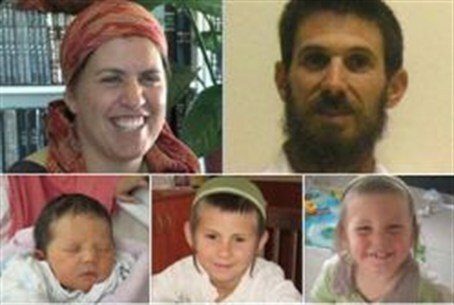 The shocking murders, which occurred in March 2011, saw the murderers kill the five members of the Fogel family as they lay sleeping on Friday night in their Itamar home. The victims were the father Ehud (Udi) Fogel, the mother Ruth Fogel, and three of their six children—Yoav, 11, Elad, 4, and Hadas, the youngest, a three-month-old infant.